Okay, I'm just going to come right out and admit this. I've been holding it in for too long. 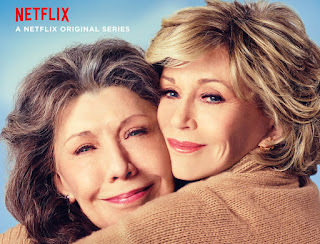 I recently watched the final episode in the second season of Grace and Frankie* on Netflix (and no, I don't want a lecture about how much energy it takes to stream stuff, cuz watching an occasional bit of plot seems to be my only guilty pleasure these days), and at the end, I felt ... well, I couldn't put my finger on it right away. Not sad that the season was over (I'm more mature than that, cough ... Downton Abbey fans ... cough ;-), not let down (the finale rocked! ), but ... oh, what was I feeling? Envy. That was it. I was feeling envious. Resentful that Grace and Frankie (yes, fictional characters, but who represent so many millions of real people) could sit on the beach and talk about their future plans -- that didn't include working on climate change! Uh huh, I was begrudging them their (made-up) carefree lives. That's because on my bad days, I feel like a climate change chump. There's so much to do when you know climate change is an emergency -- and when it seems like hardly anyone else is working on solutions. It makes me feel like I can't go dancing on Thursday nights, pick up a new hobby, or take a vacation anywhere far away. All those things would make me feel guilty. But then -- and this is where chumphood comes in -- I realize that, like Grace and Frankie, hardly anyone else makes their life decisions based on climate change or climate change activism. Barely anyone else feels guilty about going dancing on Thursday nights, picking up a new hobby, or travelling wherever they want to go. If they want to, they do. If they don't want to, they don't. What I am proposing is this: If everyone did a little bit, no one would have to "do it all." If everyone reading this post wrote one letter per day week month to your elected officials (go ahead! create some political will! ), reminding them that your descendants would like it very much if the politicians got off their fat %$# and did something about the climate crisis, maybe I could go dancing next Thursday. Or maybe take up drumming. Whaddya think? Wanna take on a smidge of the work? Wanna offset your guilty pleasures? Wanna give this climate change chump a break? Pretty please? *If you're in the second half-century of your life, there's a chance you'll adore this show!